Features an adjustable push-button slide for depth selection or full blade retraction. Heavy duty metal handle that is contoured for a steady grip. 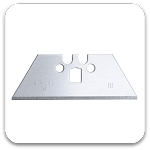 Use with X-Acto heavy duty utility blades (X292 & X492).